Exclusive interview with Ganguly, who launched the Center two years ago. 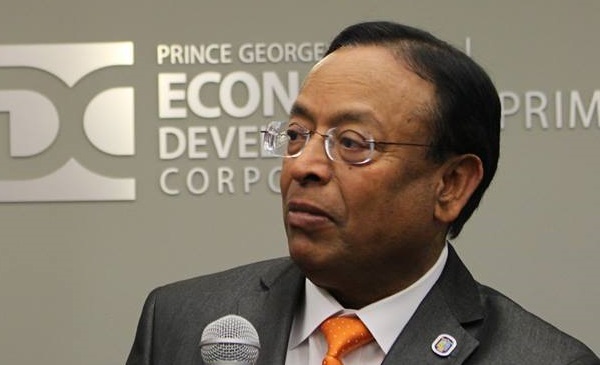 LARGO, MD: Two more Indian companies moved into the Prince George’s County Economic Development Corporation’s India Business Center on November 17th. The Center is the brainchild of PGC-EDC Executive Vice President Dr. Pradeep Ganguly. In an exclusive interview with The American Bazaar, Ganguly spoke about the Center and the EDC’s new initiative, the China Business Center. You were instrumental in launching the India Business Center at the Prince George’s County Economic Development Corporation. How did the idea germinate? I have been going to many IT and chamber of commerce conferences in India, and I have taken many business delegations to the country. I found that the large companies are very well set. They have their own teams; they had no difficulty doing business in the United States, the UK, the Middle East, or anywhere else in the world. It was the small and medium enterprises that were left behind. They were not really capable of expanding overseas, so they would stay in India and find small contracting opportunities overseas. Thanks to the new Modi administration, now they have a Ministry of Micro, Small and Medium Enterprises (MSME) that champions the cause of the smaller companies. We provide these companies the added opportunity to grow in the U.S. market. They will create more jobs in India, while growing their companies and creating jobs in the U.S. I found from my meetings and visits that if we created a soft-landing, a platform for small and medium enterprises, they can start growing their U.S. business. That was the missing link. So that’s why we created the India Business Center in Prince George’s County. It is a one-stop-shop for Indian companies. A company in India can come here, and within a short period of time — may be less than a week — we can have the office ready for them. It is “plug and play” office. We can register them as a Maryland business. Once the companies move into the India Business Center, what kind of help do you provide? When they come here, we can help them with their company registration and all the certifications that they need to get their employer identification number [EIN], find local attorneys that can help them with their visa needs, find local accountants that can help them with their accounting and tax needs (in both India and the U.S.), and connect them with banks that can do commerce on both sides — in India and in the U.S. Then what we do is provide these companies with lot of training on how to do business in the U.S. and how to find a teaming partner. We give them a facility where they don’t have to pay for the common space. A common kitchen is provided for them; so is a production room — we have a big production room where they can literally respond to RFPs that can be hundreds of pages of long — we provide that facility to them. They can Xerox, FAX and copy, they can print and they can bind proposals/reports. We provide them with conference meeting rooms that they can book and use at no additional charge. Each month, we organize or recommend training seminars and conferences that they can attend — most of them for free — that help them to grow their business, that teach them how to acquire new customers, that teach them how to keep their books. So anything a small business needs, we provide that at no additional charge. Was the India Business Center the first country-specific center you launched? The India Business Center was the first country-centric facility that we created. We still have a business incubator where local companies can come and grow. But I created the India Business Center because I saw this gap, this need; and I saw that, if we did this, it will be successful. And we have some companies, two of them are highly successful, they are growing their business, they are happy to be here. Now we are taking the same model and replicating that for China. We have 17 Chinese companies that are interested in coming to the China Business Center. It will be a very similar model. We will provide them with assistance in Mandarin, find Chinese attorneys that can help them, find Chinese accountants that can help them, and find banks that do business in both countries. For every country it is going to be different; but the model is very similar. In India, the government plays an important role; but India is largely a private sector-driven economy. The larger Indian companies already have a lot of presence here. We have in Prince George’s County, for example, Eight O’ Clock Coffee, which is a Tata enterprise, and several pharma and bio-pharma companies. Many Indian companies have set up successful operations in the United States. What we didn’t have were small-to-medium companies. We are very selective when it comes to India, because we want to make sure that the companies we bring become successful. As you know, entering a foreign market is not easy, and often complicated. We are looking for small to medium Indian companies that either have existing customers in the U.S., or have a unique product, service or business model that will be attractive to U.S. customers. We want to partner with Indian chambers of commerce and trade associations (and there are many), and the newly-created MSME Ministry. We want to make sure that we are giving them the right support. Yes, we have 17 Chinese companies interested in coming to our China Business Center, and we hope to provide them similar services. But I am sure that they will go through some attrition. I am not sure how many of them will actually open an office here. But the interest from China is huge. And I think that is the next frontier.